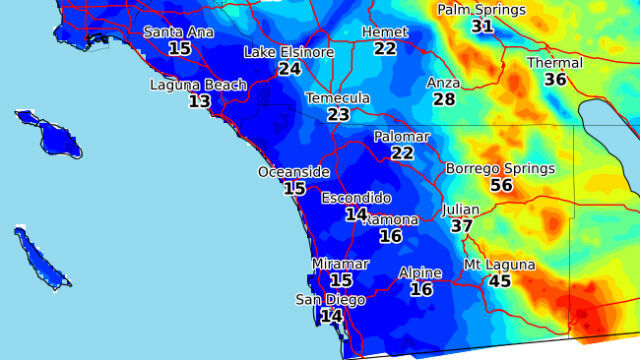 Weather service map shows peak wind gusts expected Tuesday and Wednesday nights. The National Weather Service office in San Diego warned Tuesday that high winds and low humidity will cause dangerous fire conditions in East County through Wednesday. The weather service predicted “breezy and very dry conditions in the mountain passes and desert slopes” with humidity dropping into the single digits. In addition to the wind and low humidity, a a warming trend is forecast to begin Wednesday and continue through Friday.